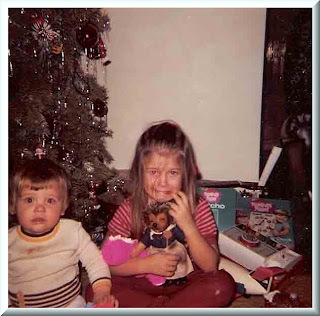 "Christmas morning 1972 wasn’t particularly pleasant for my sister, and it’s all my fault. After the presents had been opened and my parents went to prepare breakfast (and drink much needed coffee), they asked my sister to make sure nothing happened to me. Even though she was five years my senior, I was very much a 2-year-old and had my own ideas. When my sister’s back was turned, I spied a tin of Play-Doh, and in my limited experience mistook it for a can of baked beans. I must have been hungry because I immediately gobbled the contents down; not bothering to notice the taste. When my sister found me, she panicked, having failed my parents and assuming that I would soon get sick and she would be severely punished. My confused parents entered the room to discover a rather full son and a completely panicked daughter. Being the good parents that they were, they chose to capture the moment forever." This is hilarious! thank you for sharing!